MyDacia, to help customers manage the ownership of their Dacia vehicles online, access dedicated after-sales products and services, and purchase Dacia merchandise online. Since it was launched in July 2013, the website has attracted more than 25,000 visitors and doubled its number of registered users. Similar websites have been created in other countries, such as Belgium and Ireland. To promote the launch of the website, Dacia held a celebration in August, featuring concerts, test drives of Dacia vehicles. More than 5,000 people took part in the festivities. 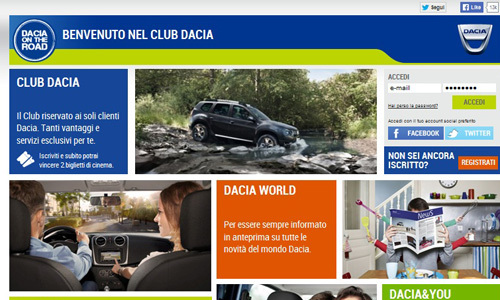 Discover Italy’s Club Dacia On The Road website and Belgium’s Dacia Cherry Club website.